Two billion people around the world lack access to affordable mobile network connections and the emergency lifeline they bring. A pioneering Guildford based company, Lime Microsystems, has developed a chip that is playing a pivotal role in enabling open source base stations, which allow rural communities considered too small and unprofitable for mobile phone operators to create their own mobile communications networks instead. The Open Source base station technology – developed by Lime partner, Fairwaves – is now connecting a number of Mexican villages. 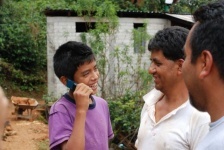 One such village is Talea de Castro, where the 2,500 residents created their own mountainous mobile phone network for just a few thousand dollars, a key component of which is based on Lime’s transceiver technology. Talea’s example is leading the way for other remote areas across Central America and for the estimated 2-billion people globally living without access to cellular networks. Just as open source project Linux has offered a genuine alternative to multinational corporate software producers in the PC operating system market, open source base stations offer a genuine alternative to the current solutions for network deployment. These can be easily manufactured and developed using freely available equipment for which Lime provides a key component. Founded in March 2005, Lime has been based at one of the SETsquared Partnership business incubators. A collaboration between the universities of Bath, Bristol, Exeter, Southampton and Surrey, the partnership has incubated more than 1,000 technology companies, which have attracted around £1 billion of investment and Lime Micro Systems is the latest star performer. Ebrahim Bushehri, CEO of Lime Microsystems said: “Wireless infrastructure is in the hands of a select few, principally tier one suppliers who dominate the roll-out of the infrastructure. Simply put, the availability of our technology means this is no longer the case. SETsquared Partnership Director Graham Harrison said: “The potential for this technology to change the world should not be underestimated. The vast numbers of people who will be helped to connect to each other will be speaking over technology brought to market in our incubator.